The Open Metadata Registry provides services for discovery, use, and administration of metadata vocabularies and schemas. It supplies tools for both maintainers and users of vocabularies. This document is intended as a starting place for maintainers and representatives of owning organizations. For users, the registry supplies an interface for searching available metadata terms and allows tracking changes to used vocabularies through RSS & Atom feeds. The registry sandbox is a non-production implementation of the registry software and can be used for testing the registry's features. Everything there works the same as in the live registry, except for the URIs (this avoids the temptation to use the sandbox as a substitute for the production-level registry). We advise playing around a bit in the sandbox before trying anything on the real thing. Metadata increasingly lives in an open world. Most older vocabulary development tools are designed to provide assistance in developing vocabularies in commercial environments or where development processes are assumed to reside 'in house.' They are usually applications designed to run behind a firewall for a good-sized organization or on a personal computer. In most cases they can provide output that can be used to develop web pages, but they assume that the organization is not interested in exposing the process itself outside the institution. The Registry is designed to be used in an open web environment--it can be used behind firewalls, but this requires more effort for the institution to manage. Group based vocabulary development and maintenance is the best approach. Most vocabularies are designed for some combination of use by internal and external parties for specific purposes: to enhance discoverability, to deal with the ambiguities of language, or to sell products. Given this reality, most groups find that the development process needs to take advantage of the wisdom of the entire group in order to meet the goals of the group. 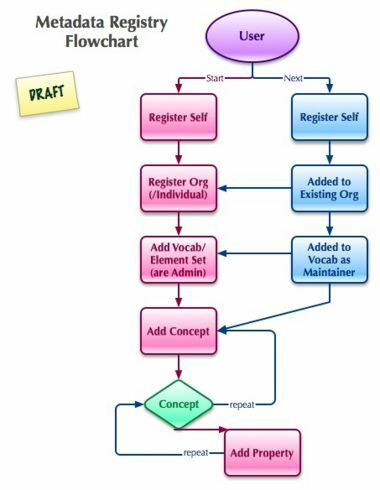 The Registry software is designed to recognize that need, and accommodates a variety of group processes and workflows, providing opportunities to build vocabularies that can improve over time and reflect changes in language. Sensible vocabulary development tools will support institutions using the Semantic Web. While many institutions are still using vocabularies in traditional ways, many are excited by the possibilities of the Semantic Web and open linked data to improve their results and make their work (whether product, description or idea) more broadly available for use and reuse by new communities of practice. The Registry enables vocabulary development to be undertaken with these Semantic Web opportunities in mind--it is based on standards and good practices developed by the World Wide Web Consortium (W3C), increasingly seen as the underpinnings that will drive the new information world for libraries, commerce and users of all varieties working on the Web. The Registry user management system is based on a simple model. An individual user begins the process by building a simple profile for himself or herself. This first user then registers an institutional or individual agent who will be the vocabulary owner for vocabularies developed subsequently. By registering an institution or individual agent, the user becomes the Agent Administator for that organization/individual. Anyone who will work on vocabulary development should register as a user. If you will be maintaining vocabularies as a part of a larger organization, you should create or join the Agent representing that organization. Otherwise, you can simply register an individual resource owner. Please note that the production Registry and the Sandbox require separate registration. You do not need to register as a user to search and access metadata resources hosted by the registry. The Step-by-Step Instructions provide a walkthrough of the process of registering users, agents, and metadata terms. This is a good introduction to the registry's capabilities and the perfect place to start if you want to learn how to work with the software. This page was last modified on 10 October 2010, at 23:35. This page has been accessed 63,728 times.